This scary costume idea took me hours to make and take off. But winning two contests made it well worth it! First I made my eye patch which I couldn’t see through. I’m sure there are other ways to make it so it is transparent. I grabbed a cotton make up pad; one of the circle ones for removing makeup. I brushed on many layers of liquid latex to give it a rubbery texture. Because it takes a little bit to dry between layers I suggest making your eye patch ahead of time. I applied three or more layers of latex on both sides of the patch. I also stretched the cotton pad out a little bit to “form” it over my eye so it completely covered it and went above my eyebrow. Now time for the fun part! First I needed to form the “mouth”. I used cotton soaked in latex and formed lips. I used putty and spirit gum to attach the teeth. 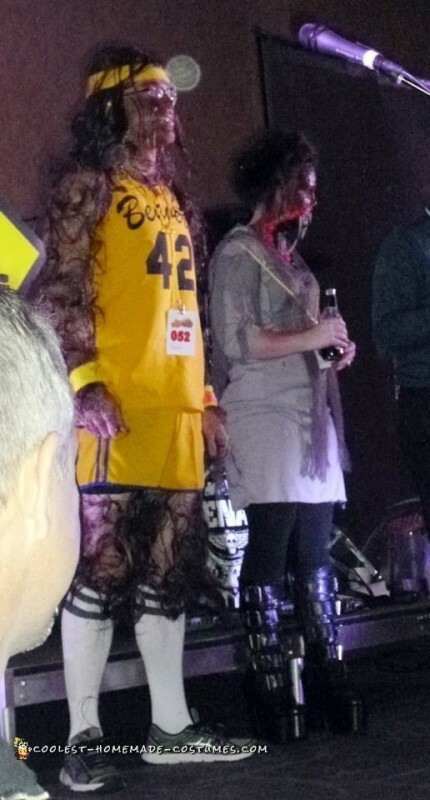 I would maybe save this part for last if I were to go for this scary costume ideas again. I then attached the patch to my face. 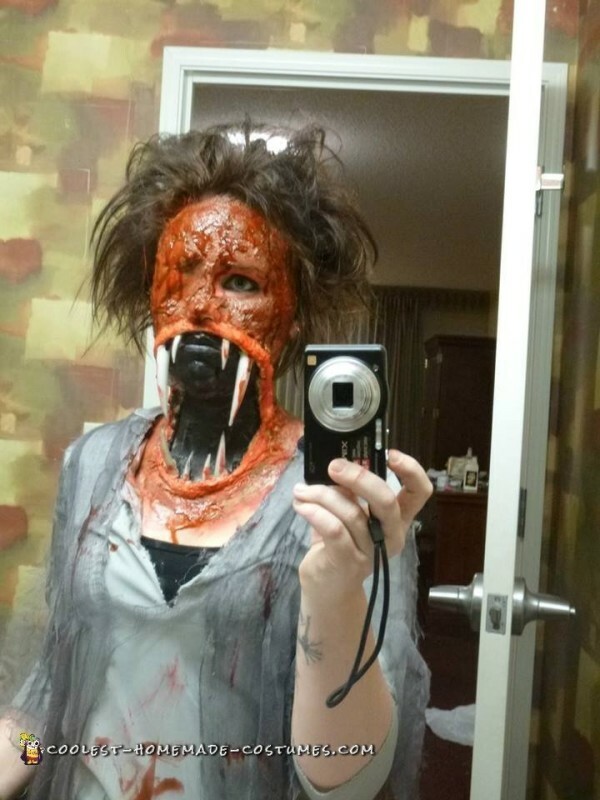 To do this, I used spirit gum. I’m sure you could use more latex and maybe even a glue stick if you are desperate. I put a thin layer of petroleum jelly alone my eyebrows and hair line to limit the amount of hair to be torn out. There will be hair torn out in the removal process. Once the eye patch was securely glued on I brushed liquid latex around the patch first for a little bit of extra security, making sure the edges where “glued” seamlessly. After that I went to town with the liquid latex and toilet paper. I used single ply toilet paper so it wasn’t too thick. I also tore the toilet paper into smaller odd shaped sizes so it gave my skin a raw, bloody texture. I had about five layers of the latex and toilet paper before I felt I could put more makeup. To speed up the dry time between layers, I used a hair dryer on a medium to low heat setting. For the makeup I started painting the black part on the mouth. I set that with hairspray. I then moved on to the bloody part. I started with red paint and then added some green and black where I saw fit. I also used colored chalk powder to add different textures. I set again with hairspray. I then moved on to my hair. That was the easiest part of this scary costume idea. I just backcombed and added baby powder for an aged, dusty look. For the outfit I just bought some grey cotton fabric and made a sack like dress with grey netting like material draped around my neck. Of course I added more blood on my clothing. For my pants I just wore black legging and I had platform “rocker” boots similar to what the band members from the band “KISS” would wear. Everyone loved it! Some people were legitimately scared. A lot of people asked how I did it and of course was it awful to do. I’m assuming they meant hard. 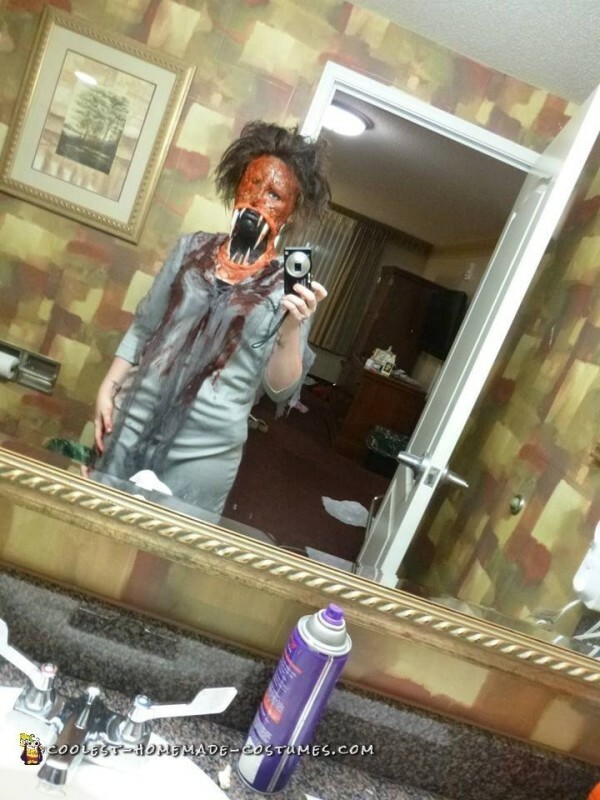 I loved putting this scary costume idea together. Creating monsters out of simple everyday objects to me is almost rewarding. I think the hardest part with this whole costume would be taking it off. Make sure you have a good amount of time to remove it with care. The second hardest part would have been waiting for everything to dry between layers. If you’re in a rush this is not a look for you. I spent 6-7 hours total in application and removal. A lot of that was waiting for the latex to dry and having to be extremely careful not to rip out hair and even skin.